Most of you would have realize a lot of creative marketing campaigns for video games revolves around a rather passive form of communication like posters, banners and magazine articles. It used to be effective and one of the best ways to market a video game was through interesting write ups on tech magazines by “video game gurus” or launching ads with beautiful game cover designs tactically placed across the country on billboards or little posters at video game shops. These days, with the massive proliferation of rich content in the game industry, it is absolutely necessary to craft an experience rather than communicate one. Sid Lee and Ubisoft has recently came up with a project for “Assassin’s Creed IV: Black Flag.” The marketing campaign drives across their communications through online and offline. Fans were asked to log on to a site, where they would see an artwork created by artists from L’Ecole Nationale des Beaux Arts in Paris. You see a really detailed painting of a fighting scene somewhat in the era of the “Age of Piracy” along the timeline where the video game is set to be. 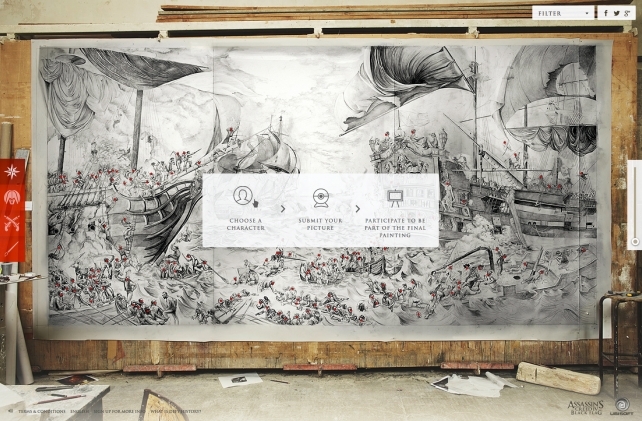 The interactive aspect of the campaign requires users to use their webcams and have their faces placed on the characters within the painting, and the most popular faces would be featured as part of the painting. To sweeten the deal, it is said to have their faces painted on as part of the actual piece of art to be displayed in Le Musee de la Marine this November. Again, we are witnessing a creative way of engaging consumers by getting them to be part of the marketing campaign. Naturally, we would expect social and other online media to be tagging along. Great work.